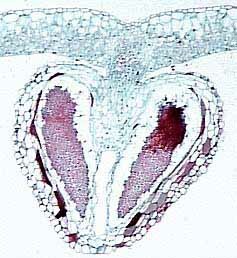 Ferns (Figure 6.7), just like many other plants we have considered so far, are free-sporing vascular plants. They constitute an extremely variable group whose members have megaphylls (fronds), anatomically-differentiated roots, and sporangia born on the leaves, which may or may not be modified to bear sporangia. 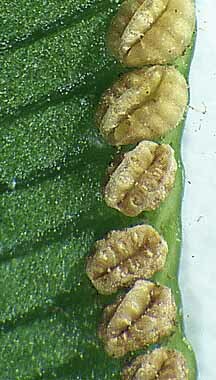 On the leaves, sporangia may be terminal (marginal) or abaxial, and are commonly clustered together to form synangia. Typically, the fronds develop from croziers or fiddle heads that develop into a single plane. The ferns also maintain a free-living gametophyte stage (VG 2:1), along with the robust sporophyte that is familiar to us. Although the ferns share many similar features, there is no single characteristic trait that can diagnose a plant as a fern. Although many unanswered questions remain, exciting research on the evolutionary relationships in ferns are on-going here at Berkeley. New work suggests that the leptosporangiate ferns (see below) are monophyletic. However, the more ancient, eusporangiate ferns appear to be entirely paraphyletic with synapomorphies gradually accumulating toward those characteristic of leptosporangiate groups. This makes fern groups tricky to define phylogenetically but may also provide an interesting case study on the accumulation of characters during the evolution of a lineage. General morphological organisation of a fern. The ferns have a long fossil history beginning in the Late Devonian with finds of diverse reproductive structures, fronds, and permineralized stems. These early fossils, generally included in the Cladoxylales (e.g., Hyenia and Calamophyton) or the Coenopteridales, are thought to represent the sorts of plants (grade!) out of which the ferns must have evolved. You will find some of these order-rank names in the literature and so we mention them here. However, keep in mind that these are not clear evolutionary groups and probably represent a grade of organisms out of which the fern lineage emerged. As a result, the groups themselves are not particularly useful, but the pattern (grade giving rise to clade) offers food for evolutionary thought. Furthermore, many of these so called "preferns", have been previously -- and often equally convincingly -- assigned to such varied groups as lycopsids, seed ferns, and intermediates between sphenopsids and ferns. This pattern is indicative of the problem of missing synapomorphies mentioned earlier! Because the systematics of this and other early groups of fern-type plants leads to more confusion that clarity -- for example with most fern paleobotanists developing their own classification scheme -- we will not discuss it further. Instead, we will focus on describing important fossil taxa that have been successfully included in cladistic analysis. If you are interested in the ins and outs of fern systematics, consider Taylor & Taylor (1993) or Stewart & Rothwell (1993) for somewhat different perspectives. Even when leaving out some of the Devonian diversity that has been attributed to the ferns, you will undoubtedly be overwhelmed by the variety and complexity of the ferns as you peruse this handout. Fear not. Your goal is to become familiar with the basic features that unite the wide range of forms that constitute the ferns, and to sample the variety that occurs within the group. Try not to be overwhelmed by names, but rather get a sense for the major morphologic forms and evolutionary groups. Before we can embark on a study of ferns and their fossils, a little basic structural terminology is required. Fern leaves are called fronds, and have their own terminology that is illustrated with reference to a modern fern frond (Figure 6.8). As you work through the concepts of frond structure, examine the modern ferns available in lab, identifying each region as you go. Remember, however, that the frond is just a compound leaf and not a stem. The stems of ferns are much reduced -- commonly to rhizomes only -- and may be entirely underground. The main axis of the frond is called the rachis. From the rachis arise lateral "branches", commonly in a single plane; these are called primary pinnae. If the primary pinnae are divided, then the individual divisions are known as pinnules. If the pinnules are further divided, these are referred to as segments. Pinnules and segments are commonly laminar and are the main photosynthetic units of the fern frond. Note that near the tip of the rachis, pinnules may be attached directly to the main axis even in a twice pinnate frond (like that illustrated in Figure 6.1 on the right). Proximally, segments may be attached to pinnae, and still farther down, pinnules can be attached to the pinnules. If the pinnae or segments are lobed, the embayments are known as sinuses. Please don't spend a lot of energy memorizing these terms. They are presented here so that you will have the needed background to understand discussions in lab and lecture. The petiole or stipe is the stalk at the base of the frond, before the first pinna "branches" from the rachis. (The term "petiole" is more universally applied to the structure that connects leaves to axes. It is particularly elaborated in compound leaves such as fronds.) Fern petioles commonly have leaf traces that take on strange and wonderful shapes. This differentiation in trace morphology is a feature often used in fern systematics, particularly in the fossil record. Sporangia are usually abaxial on pinnae (you may see them as brown dots on modern examples) and occur in clusters called sori or synangia. Sporangia can be thick-walled and can lack specialized zones of dehiscence, in which case they are called eusporangia (Figures 6.9) (VG 2:2) (VG 2:3); or sporangia can be delicate with walls only one or a few cell layers thick, and have areas where sporangial cells are modified for dehiscence, the annulus, in which case they are leptosporangia (Figure 6.10) (VG 2:4) (VG 2:5). Eusporangiate sporangial character is primitive to ferns and is more like that of early land plants (e.g., Rhynia, Pertica), lycopods and sphenopsids. 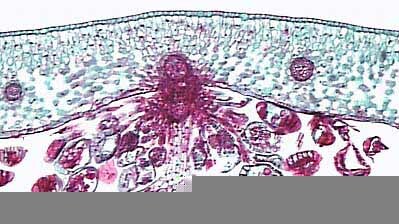 Leptosporangiate forms are derived and autopomorphyto the ferns. 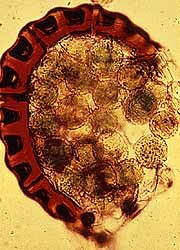 Eusporangiate fern (Marattia). (A) Abaxial view of fertile segment, (B) sorus (synangia). A variety of sporangia forms in the leptosporangiate ferns. You will notice in some cases that the label with the specimen doesn't match exactly with the name mentioned in the lab manual or in Taylor & Taylor's discussions. An example of this might be Ankyropteris glabra and Tedelea glabra. This is not a clerical error but science in action. 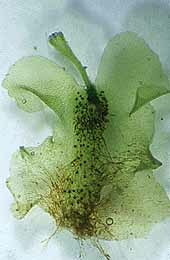 In this case, the species (= specimen) was described as Ankyropteris glabra. Only later was this species' affinity with the Tedeleaceae recognized and the generic name was revised to reflect this relationship. When naming a new fossil taxon, one tries one's best to give it a name that is evolutionarily appropriate. However, more material or new techniques commonly are cause for revision...in fossil and modern plants alike. In most cases, the synonym (revised name) is noted in the lab manual. However, you may encounter a few specimens in the collection that we have not noted. When in doubt, ask! More exciting still, botany and paleobotany are in the midst of a major debate over how plants should be named. The traditional system (in which all plants must be assigned to a species, genus, family, order, class...) is being re-evaluated. Some workers have proposed that we abandon these rank classifications in favor of a non-rank system that will speak only of monophyletic clades. Under such a phylogenetic system, plant groups will be defined by synapomorphies and all groups will be natural and have evolutionary meaning. This proposal holds both promise and problem for paleobotany. Many fossil plants are poorly preserved or known only as dispersed organs. In this case, there may be too few score-able characters to include the fossil in a full-fledged cladistic analysis. Traditionally, paleobotanists have classified such fossils based on overall similarity. This has led to many arguments and may blur the true evolutionary significance of a particular fossil. An alternative is to try to circumscribe the incomplete fossil within a synapomorphy-defined lineage based on the characters it does possess. Although this seems extremely unsatisfying and may lead to many ambiguously-labeled museum drawers, it represents a useful first step toward congruence between names and the evolutionary pattern we want them to represent.